In eight days, the Women's Eagles Sevens will suit up for the first ever U.S. hosted Rugby World Cup at Rugby World Cup Sevens 2018. The named 12 -- announced today by Head Coach Richie Walker -- comprise a group of talented and experienced athletes who will represent the United States in full force on home soil at the famed AT&T Park in San Francisco, July 20-22. Seeded fifth and facing China in the Round of 16 at 12:34 PM PT on Friday, July 20, the United States must remain undefeated in order to advance; with the Women's Champion crowned on Saturday, July 21. A limited number of tickets are still available at rwcsevens.com/tickets while all matches will be broadcast LIVE across NBC Networks. "We've really spent the last several weeks evaluating where our focus and our mindset needs to be in order to perform to the best of our abilities," said Head Coach Richie Walker. "Our players have been building towards this tournament for years and to represent their country at home is remarkable in and of itself. We look forward to sharing our journey with home fans in San Francisco." Of the 12 athletes set to take the pitch next week, nine are 2017 Women's Rugby World Cup athletes (15s), four also competed at the 2016 Rio Olympic Games and one is an impressive new face. With a significant amount of pinnacle event experience, the Women's Sevens are well-prepared to face the challenge of straight knockout competition at AT&T Park. Among them, newcomer Ilona Maher will build on her successful two-try tournament debut in Paris, following the lead of a seasoned group lead by Captain Nicole Heavirland. High scorers Naya Tapper (130 points) and Alev Kelter (138 points) will look to light up the pitch again also as both finished the season ranked fourth in most tries and most points scored by a player, respectively. No stranger to points herself, Lauren Doyle returns having scored in all but one of the Eagles matches in Paris; while Kris Thomas will attempt to surpass her own benchmark of 50 career tries. Walker and the Women's Sevens completed the 2017-18 HSBC World Rugby Women's Sevens Series in fifth place. 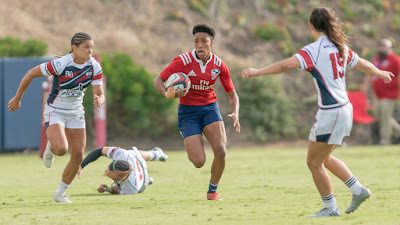 Beginning the season with a silver medal finish at Dubai Sevens; and adding a bronze medal finish towards the end at Langford Sevens, the team tied their highest concluding position in the Series and set a record by medaling twice for the first time within one season. Overall, the USA currently sit in the Top 5 of four major team categories including most points scored (5th), most tries scored (5th), restarts (5th) and conversions (4th). And, with the event taking place on home soil, the energy of a home crowd will surely drive the squad to showcase the best of each category. Rugby World Cup Sevens 2018 will begin on Friday, July 20 with the Women's Eagles Sevens set to face China at 12:34 PM ET, LIVE on NBC Networks. A full broadcast schedule is available here while a limited number of tickets are on sale at rwcsevens.com/tickets.